Access SWIS to apply for field. a. Log in using your myBama password and ID. a. The home page gives you a list of all items that need completing for your application to be considered. The only item that you cannot complete at this stage is the Field Placement Tracking Form. b. Please note the tab across the top as well. Make sure that you visit each tab in the process to complete the entire application. Let’s start with the Field application. You can get to the application by using the tab on the top or clicking on the Field Application in the list below. 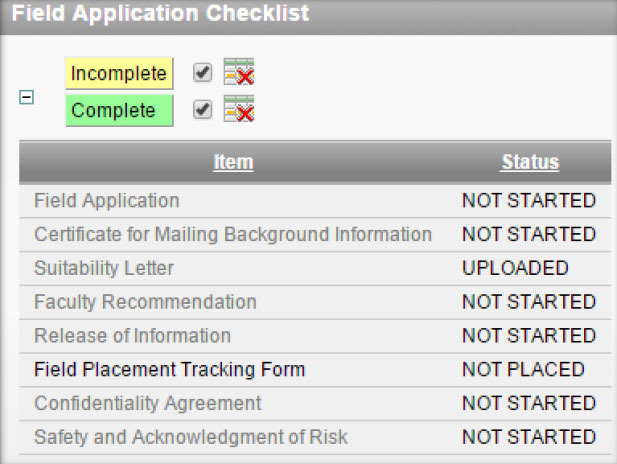 To continue to the application, click on the Field Application tab (highlighted in yellow above). a. The information that is preloaded into the following fields is pulled from your myBama account. b. Please make sure that all of the information is correct, as we will use this information to contact you. 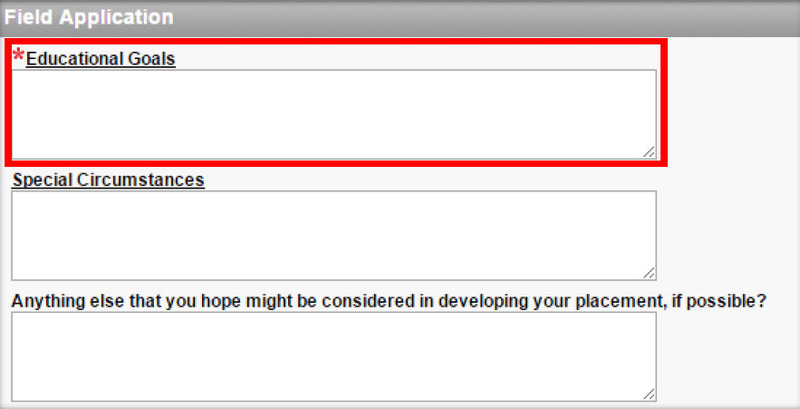 c. You will also need to select an emergency contact (see blue link in the image below). Your application cannot be completed unless you select an emergency contact. d. If you need to correct any information, you will need to login to myBama and make the necessary changes (see instruction in the yellow box below). a. On campus/face to face cohort: We do not place on campus students in other states or in counties far in proximity to The University of Alabama. You will need to select your top three counties for placement in order of preference closest to Tuscaloosa. Most on campus students select Tuscaloosa and Jefferson counties as their top two choices (be sure to rank them). You will then need to select a third county. b. DL cohort: DL students please select the state or state and counties in Alabama that you would like to be placed. For DL students in Alabama you will need to select three counties in order of preference. c. Students applying for DC Program: Please select DC as your first preference and then follow the on campus or DL cohort instructions for your final two selections. d. We strive to place you in your top geographic location but that is not always possible. b. Please indicate whether or not you are a child and adolescent concentration (CAF) or adult concentration (AF) by checking the appropriate box. Also please indicate whether or not you have a program administration (PAA) emphasis. This must be checked/completed correctly in order for the field office to place students in correct agencies. a. Please select your top five areas of interest. Please remember that your areas of interest should correspond with your concentration if you are a 2nd year MSW/Advanced standing. For example if you are an AF (adult and their families concentration) and you select child welfare as an area of interest we cannot place you in child welfare due to your concentration. We will consider these areas in making your placement. However, depending on location and other barriers top areas of interest are not always possible. a. If you are interested in applying for one of the stipend/internship programs the corresponding stipend/internship programs will be available for you to check once you select your concentration. If you check that you are interested in stipend program your information will be forwarded to the correct contact person and the agency will contact you for further application processes. b. The narrower in focus you are, the more difficult it is to place students. Narrow Example: I would like the opportunity to work with children in a medical facility. I have a particular interest in Neonatal Intensive Care Unit. a. If you are not placed in a medical facility with children, other agencies that we send you to will read that statement and think you are not a fit for them. Instead talk more broadly about your goals. opportunity to work with children who are facing barriers to a successful start in life. a. You will also want to think about including other important educational goals. What do you want to learn? Skills, therapeutic modalities, group techniques, proper documentation? What will you need to maximize your learning? Hands on experience, shadowing, strong supervision, observation? a. In this section please describe any special circumstances that might affect your field placement (e.g., need for reasonable accommodations as specified through the Office of Disabilities, need for extended placement, need for placement in area other than Tuscaloosa, etc.) Reasonable accommodations will be provided for students with Reasonable accommodations will be provided for students with documented disabilities including but not limited to attention, physical, sensory, systemic, cognitive, learning and psychiatric disorders. If you believe you have a disability requiring an accommodation in your field setting, please notify the Field Education Office, and the University of Alabama Office of Disability as soon as possible. The Field Office will work with you to identify an appropriate educational experience and provide the Field Instructor with verification of your disability and recommend appropriate accommodations. Please note that your accommodations cannot be activated unless they are filed with the Field Office. 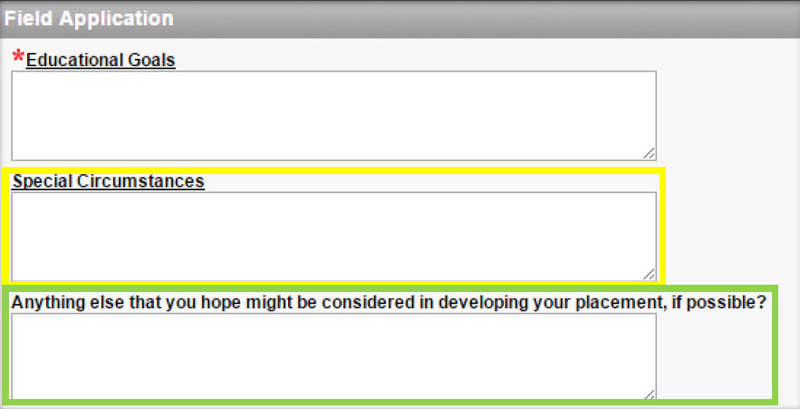 In this section you can tell us anything you would like for us to consider when making your placement. This can be personal (job, family, transportation etc.). This can also be more information about you that you do not want to send to the agency. Some students use this area to discuss BGC issues, give more detail about agency interests etc. Use this section to tell us more if needed. a. Please list your current place of employment. This helps us with making placement decisions. c. Please answer the transportation questions. b. Please remember that you can only choose this option for one of your two years. If you choose yes, you can download the application fill it out, and upload it to the application. You will need to do this before you submit the application. a. Please upload your resume. Make sure you include your most recent internship, job experiences, or volunteer experiences. Please proofread. Your resume will go to the agency. If it is not uploaded the agency will not receive a resume. This will cause some agencies to deny students. a. Please authorize that we can send the information to the agency by checking the box. Please note that if you have a FERPA hold on your educational records we cannot send your information without you removing the hold. If we cannot send your information, the field office cannot arrange a placement. We will let you know if our system indicates there is a FERPA hold. The only information that the agency receives in the initial e-mail is your name, contact information, educational goals, and resume. a. Please complete the date you mailed you BGC information into the company. This will help us track the progress of your BGC. Please check that you understand your responsibility in securing a suitable background check letter before you begin placement. If you are concerned about any background check issues please contact the field office as soon as possible. a. State of Alabama Students: You will be mailed your Background Results in the form of a Suitability Letter. The letter will inform you whether or not you meet suitability requirements. Please upload this letter in this section. If you do not meet suitability requirements please upload letter and contact the field office as soon as possible. a. You will also need to select a faculty recommender. Please click on the faculty recommendation tab and select your advisor for faculty recommendation. Your advisor will be sent an automotive e-mail to contact you to discuss field education goals. They will then provide a recommendation to the field office. Please note that some faculty will choose to decline a recommendation due to workload issues. If this happens you will receive an e-mail asking you to choose another recommender. At this point you can choose another faculty member. a. There are several forms that will need to be completed as well. These forms include: Acknowledgement of Risk, Confidentiality, and Release of Information (all these can be found on your home screen). You must download the forms, print the forms, read the forms, sign them with a written signature and upload into SWIS. A typed signature will not be accepted. These forms must be completed before field placement.